The ExplorOz online shop now offers a way to compare items when similar products are available. 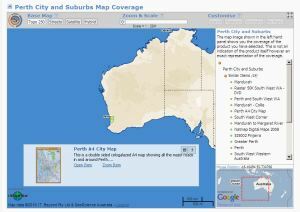 Our proprietry map coverage tool that enables online shoppers to know exactly what area is covered by any given map in our shop now automatically shows you a list of similar items, which you can click to compare. The list of similar items is shown in order of scale. Read More. Is this the best camping guidebook ever? The brand new publication Camping Around Australia, published by Explore Australia, has just arrived and is causing quite a stir. This book is the most comprehensive nation-wide camping guide available, with listings for over 2500 campsites covering every state and territory. 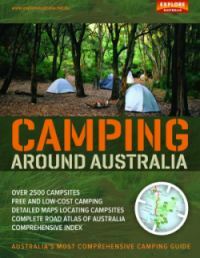 Detailing facilities and activities for each campsite, along with driving directions, full colour photos and an Australia-Wide Road Atlas, this book is a modern and easy to follow guide that is the perfect travelling companion for any camper, all for only $39.95! Did you know that we regularly release our latest product news and exclusive special deals in a dedicated Shop blog? We realise that for some this is too passive - some of you have told us that you want to receive an instant alert to advise you of the latest special offer. If that sounds like you, then... Subscribe to our Shop News RSS feed and you'll never miss out! The long awaited "save" feature is now offered to Members using our online tracking service EOTrackMe. After saving, your track file will appear in your Member Profile, where it is known as "My User Treks" and indexed by year date for your convenience. Editting the name and description of your User Treks is also now available. Did you know that you have access to 167 Trek Notes (route data + supporting text/photos) + 861 User Treks (route data only), making a total of 1028 track files that can be download from ExplorOz? The term "User Treks" now replaces "Plot Swap" so we have added a new sub-heading under the Treks menu for browsing User Treks - this shows a map of Australia with clickable route-lines or you can look-up by Member or Visitor name. ExplorOz.com is currently enjoying nation-wide television coverage with the re-airing of Series 2 of ‘Pat Callinan’s 4X4 Adventures’ now on prime-time ONE-HD. ExplorOz.com is featured in every episode and once again we expect to pick-up a greater number of newbie adventurers after Pat refers them to use the ExplorOz website. Great news for our Business Members! ExplorOz is also happy to announce that we will feature in the upcoming third season, airing later in the year. Gosford Sailing Club, who have setup 18 SPOT devices to the EOTrackMe online tracking service for this weekend's Lord Howe Island Yacht Race. 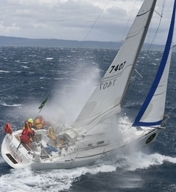 So catch the action online, either through the map shown in their profile page, or on the official Lord Howe Island Race 2010 website. ExplorOz is the official supplier of online tracking services for Australia's most exclusive ocean race - the Lord Howe Island Yacht Race. Starting tomorrow from Gosford Sailing Club all yachts are fitted with SPOT satellite tracking devices and are registered to EOTrackMe so check it out this weekend!